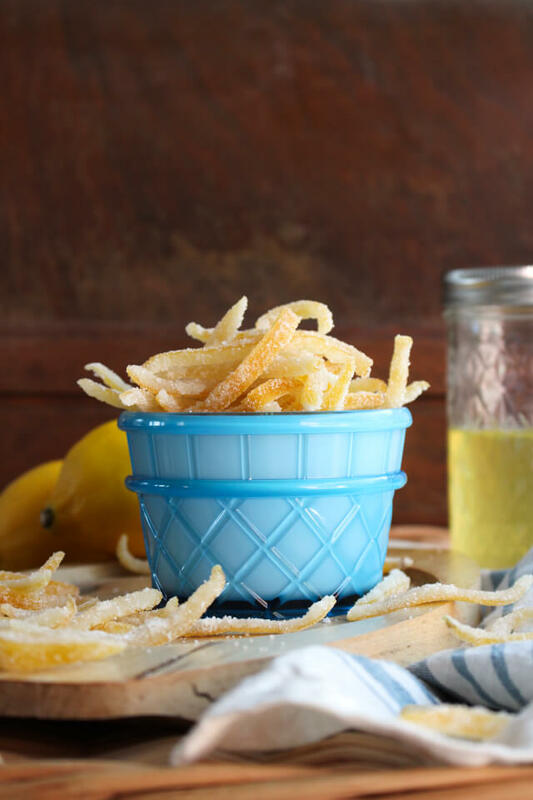 Making Candied Lemon Peel is a way to practice the 'waste not, want not way' of life by transforming the lemon peel you would normally discard into an irresistible sweet snack! Even after juicing and juicing and juicing, we would always have some fruit leftover. We harvested way more oranges and grapefruit than one family could possibly need so, naturally, we shared with our family. That's how I first learned about candied citrus peel. My husband's godparents were in town during one of our harvesting times and we sent them back to Virginia with a trunk full of oranges. A little while later I got a card in the mail from them with a picture of a bowl a candied orange peel. They included a little note that said that they loved the oranges and, because they don't like to waste anything, they made candy out of the peels. 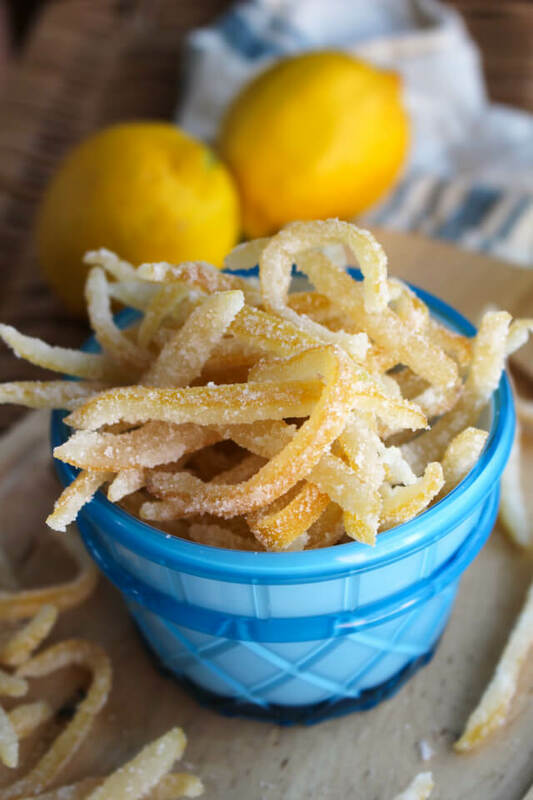 Up until that moment, I had honestly never heard of candied orange peel. I had to know more. After all, I am a waste not, want not type of gal. I did a little bit of googling and learned that you can make fabulous candy out of not only orange peel, but citrus peel in general. Who knew? The process is simple. Cut up the peel, boil it several times to remove the bitterness, then simmer it in a sugar and water mixture until it is soft and sweet. The icing on the cake, so to speak, is a crunchy sugar coating. After a few hours of drying on a rack, the candied peel is ready to eat. And eat and eat and eat! Even my 8 year old loved it! Her exact quote was, "Why can't lemon always taste like this?" I also learned during my googling that you can make a killer household cleaner with citrus peel, so if you find yourself with citrus coming out your ears, definitely look that up. I'll be over here candying all the peels though. 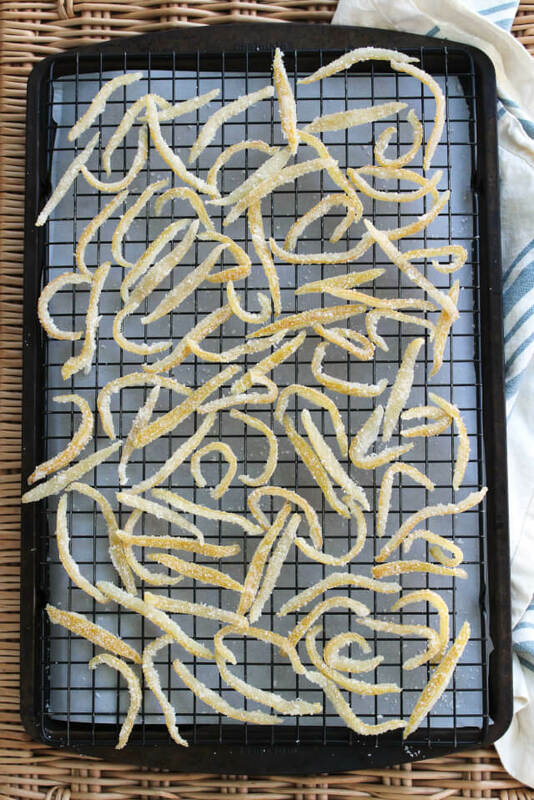 Unless I've got way too much candied peel on hand already. Foodie to the core, yo. 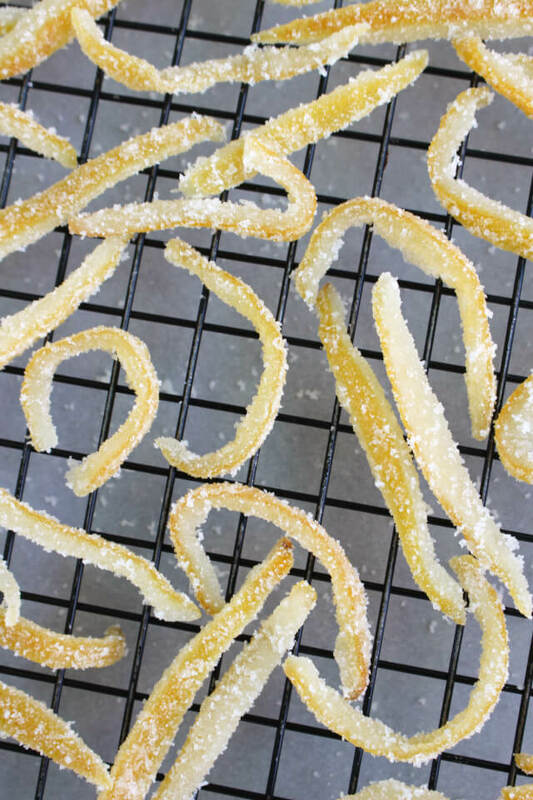 This surprisingly simple Candied Lemon Peel recipe is inspired by this month's Feast & Devour Cooking Club ingredient selection. 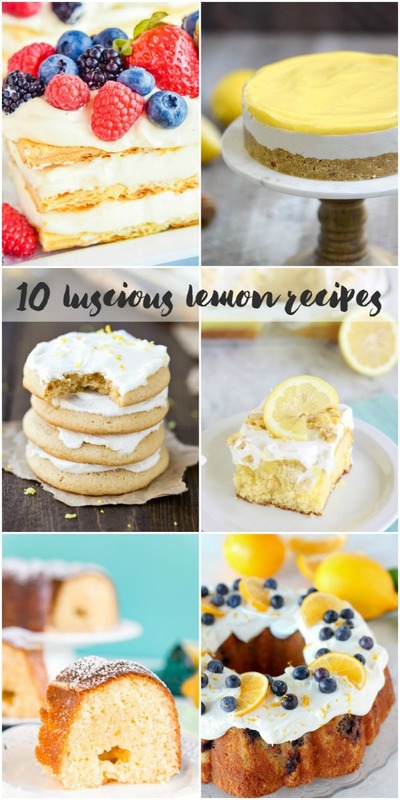 Viva la LEMON! Cut each lemon into eight sections. Using a sharp knife, cut the peel off of the lemon sections, along with a small section of the white pith. Cut each peel into three thin pieces. Save the lemon for another use. In a medium saucepan, cover the lemon peels with water and boil for 5 minutes. Drain and repeat two more times for a total of 15 minutes. Drain peels and set aside. In the same saucepan, combine 1 1/2 cups of the sugar and the water. Bring to a boil, stirring occasionally. Add the blanched lemon peel, reduce the heat to low, and simmer for 60 minutes, stirring occasionally. The lemon peel is done when it begins to look translucent. Drain the lemon peel, reserving the lemon syrup for another use. 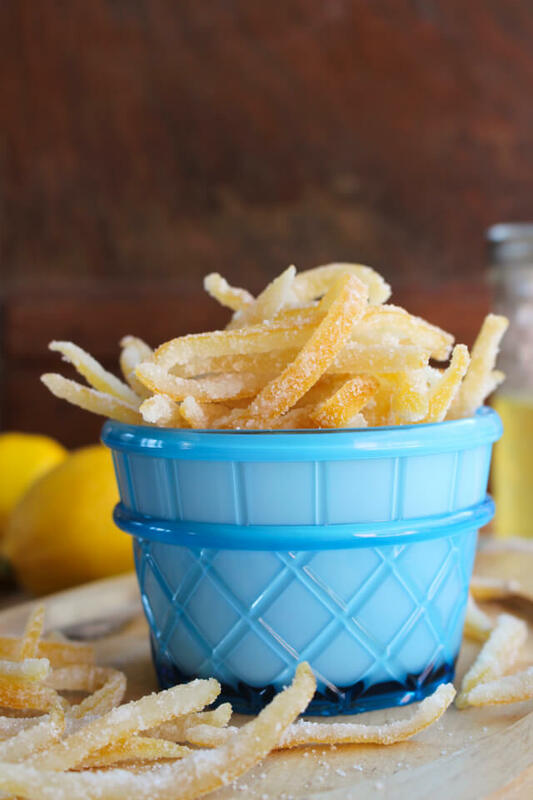 In a shallow dish, coat the lemon peels a little at a time in the remaining 1 cup of sugar. Place the peels into a colander and shake to remove excess sugar. 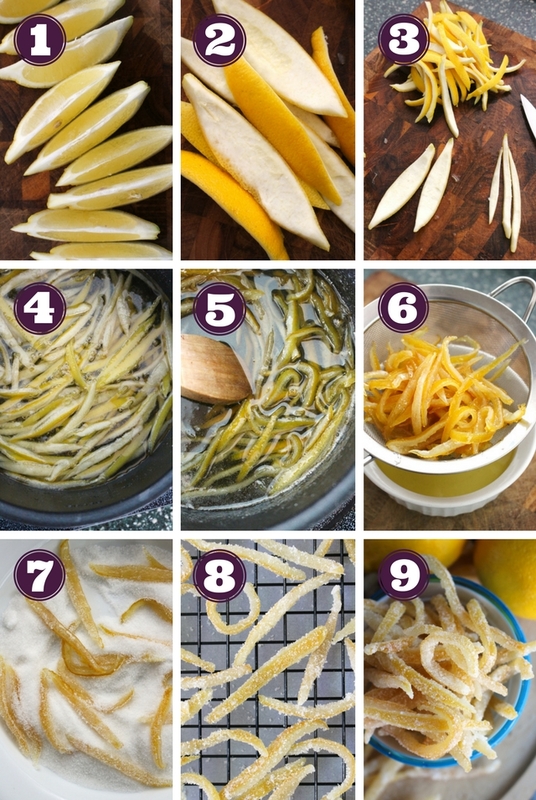 Arrange the peels on a wire rack placed over a baking sheet. Dry for at least 4 hours on the wire rack and store in an airtight container. The leftover lemon syrup makes the most amazing lemon drop cocktails!